Black & Decker is recalling Random Orbit Sanders after more than six dozen reports of a piece shattering or flying off during use that caused at least 15 injuries, the U.S. Consumer Product Safety Commission said. The culprit is the black plastic disc on the bottom of the sander that is used to hold the sandpaper, the CPSC said. Consumers have reported to Black & Decker that the disc has either broken apart -- sending sharp pieces of plastic flying -- or the entire piece shooting off the sander in its entirety. 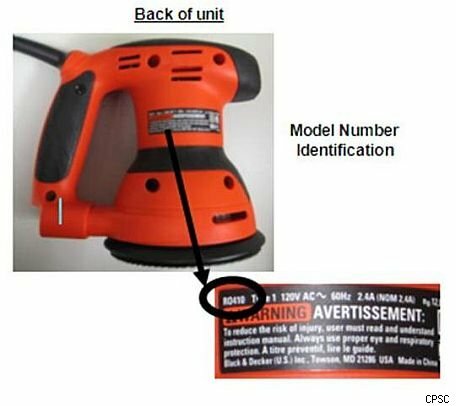 Of the 73 incidents reported to Black & Decker, 15 involved people getting hurt -- including one person who suffered serious facial cuts, the CPSC said. Federal law requires that companies report a potential product danger to the CPSC after learning of a problem that could cause serious injury or death. Consumer Ally is awaiting a response from Black & Decker about why it took so long to recall the sanders. The Chinese-made orange and black sanders were sold for about $40 between January 2007 and July 2009. The recalled sanders have the following model numbers: RO400, RO400G, RO410, RO410K, RO410LW and FS3000ROS with date codes between 200701 and 200929. A depiction of where to find the model number on the sander is in the accompanying image. The date code is on the bottom part of the sander, where you put the dust bag. Consumers can get more information by calling Black & Decker at (866) 220-1767 weekdays between 8 a.m. and 5 p.m. Eastern Time Monday through Friday.